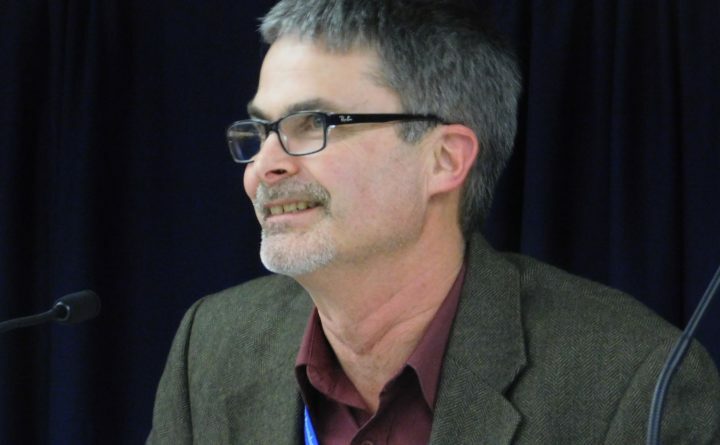 Doug Bousfield, director of the University of Maine Paper Surface Science Program in Orono, is developing new types of coated paper for packaging food that is completely recyclable. The current potato chip bag will go the way of the dodo by 2025 if Doug Bousfield has his way. The University of Maine professor aims to develop fully recyclable packaging using cellulose nanomaterials derived from wood pulp. The cellulose nanomaterials hold promise for replacing the thin layer of noncompostable aluminum used now to keep oxygen from getting in to spoil the chips, and grease from the chips from getting out through the package to soil consumers. “We’re looking at alternative packaging based on cellulose nanofibers to replace common snack packaging, so it should break down,” Bousfield told the annual Paper Days meeting of Maine’s paper industry at the university, held Wednesday and Thursday. Cellulose nanofibers are a big area of research at the university, which also is the largest nanocellulose manufacturer in the United States for use by itself and its industry partners, Proserfina Bennett, managing director of the UMaine Process Development Center, said. Researchers like Bousfield are developing new types of paper and paper coatings that they hope will create new markets for paper. Today’s potato chip bags are an obvious target for him. They contain plastics and metals that do not biodegrade. And while Bousfield points to PepsiCo’s goal of making its Lay’s potato chip bags out of recoverable or recyclable materials by 2025, he said there’s a lot of work to do to get to a world with fully recyclable snack packaging. The market for such flexible packaging was $210 billion in 2015 globally and is predicted to grow to $248 billion by 2020, according to British market research firm Smithers Pira. But a lot of the packaging included in those numbers still doesn’t break down and ends up in landfills or in the oceans. “There are 8 million tons of plastic dumped into the ocean each year,” he said. Kendra Fein, a UMaine graduate student also studying packaging applications, said fish mistake some plastics for food. “There’s a chance you’ve already eaten some plastic [in fish],” she said. But coming up with a totally recyclable potato chip bag is difficult and will take time, Bousfield said. Any new bag will have to replace plastics that seal, act as barriers and provide stiffness to the bag. And simply replacing the aluminum layer with a cellulose nanomaterial will only remove one of the non-recyclable layers. New coatings also could open new markets for paper. Caitlan Howell, an assistant professor in chemical and biomedical engineering at UMaine is focusing on patient care using coated paper products that may eventually be more effective in diagnosing and preventing infections. Resistance to antibiotics is a big issue that she is trying to address with a slippery paper coating that can detect and redirect the movement of the bacteria so it can be collected more easily, potentially helping prevent infection. “We are using super slippery paper in the form of a V-shaped cup,” she said. The aim is to get the bacteria to slide down the inside of the cup and collect at the bottom for testing. She used the Nepenthes Pitcher Plant, which also has a slippery surface to catch insects, as a model for the design. Howell also is collaborating with a virtual reality laboratory at the university to create a digital readout system for the collected bacteria. The technology might also be used in industrial applications, for example, to prevent clogged pipes, and for self-cleaning materials for homes. Other UMaine researchers are focusing on artificial intelligence and machine learning technologies to make paper mills run more efficiently and automatically. He said that shifting human intelligence into process control equipment, mill machines and even the factory itself increases efficiency and lets the machines themselves detect and respond to unexpected events, like the failure of a complementary machine. But like any automation, Turner said workers will worry about losing their jobs and lawyers will fret about who will be at fault if the machines go awry. “Artificial intelligence will ultimately lead to increased efficiency, but it will be a long time in coming,” he said. But the payback for mills is expected to be high, Sofian Audry, an assistant professor of new media at UMaine, said. “Profitability could increase by 38 percent on average by 2035 for businesses that successfully apply artificial intelligence,” he predicted. Apart from the benefit inside the factory, he said artificial intelligence can be used for marketing and advertising, to improve business relationships and to make transportation more efficient.